Super R-Type is fun - Until you die! Prepare for a pretty bad week if you don't like shooters - Then again, it's also not very good even if you do like them. Super R-Type will seem great when you start, with good graphics, a nice soundtrack, the usual fun R-Type gameplay and more. This probably changes when you die for the first time though, and realize that every time you die, you get sent back to the start of the level. There are no checkpoints in this game to respawn at, so unless you're absolutely fantastic at shoot 'em ups, you'll most likely never make it to the end. The game was rated by the USK all the way back in 2006 though, so at least it's finally off the Coming Soon list! Today's other game is Operation Wolf. This is a very lackluster port of the arcade game with the same name. The original NES cartridge could be played with the NES Zapper, making it at least somewhat fun, but the VC version does not allow Wii remote zapping, so it's definitely not worth the admittance fee. The US get Brawl, but that's apparently not enough. As well as that, they get two import titles. We a worse sequel of a game and another that lacks Wii Remote IR/Zapper functionality. sigh I'm getting a bit tired of saying "maybe next week..." This week is pretty much non-existant to me. Nintendo should realise two games of the same genre in the same week is not good. Okay, so they're not identical but they are similar. I was planning to get Puyo Puyo 2 and now I find this. I'm officially pissed off with the Virtual Console now. Eh, I like Super R-Type. Sure, it certainly isn't without it's flaws, and there are tons and tons of other games in the genre on the VC already, but don't disregard it just like that yet. Operation Wolf, however... the less said about that, the better, really. Come on Shortay-01, at least you guys can kill time by playing Mario Kart Wii while waiting for Brawl. I am getting mighty sick of shoot-em-ups and average-poor games. Can't Europe/Australia get Super Smash Bros. or Super Mario Kart to make up for the Brawl Delay? I am quite pleased with getting Super-r-type this week!! I've been waiting for pilot wings and Mario Kart for the snes for ages now. Fingers crossed the big N gives us Mario Kart in time for the Wii release like they did when Galaxy came out we got SMB3!! Too bad, I was right and NoE is so stupid and will release import titles together with great games like Mario Kart . Any Chance that Australia got DoReMi today secretly? Only two games... I really hope Nintendo got something big up their sleeve for next Friday. I'm getting pretty tired on Nintendo's policy, two games and only one of them (super R-type) is worth downloading. There is a lot of good machines on the VC now. Nintendo could easily release three or four games a week and two of them could be top-of-the-line titles. 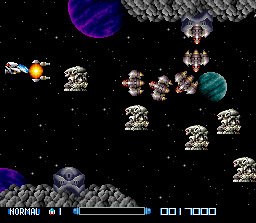 We should be celebrating - after all, this marks the Virtual Console's 100th side scrolling shooter...or at least it seems like it. No More Heroes and Harvest Moon come out on Wii today, which'll do me just fine. Operation Wolf really looks awful. Even the C-64 Version looks better iirc. As far as the release strategy goes I can say that I wouldn't want like 3 Top Games each week but they could at least aim for 3 Games total per week. Yay finally Super-R Type is finally here. I was actually praying it would come to the VC the day before. even though its not as good as the other 2 R-Types on the VC i will still give this a go. 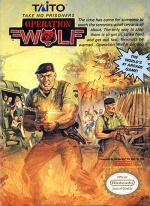 Operation Wolf on the otherhand is really pointless due to the lack of zapper support and it doesen't help its a bad arcade port. Would be better if it was Ghosts and Goblins though. Super R-Type is a terrific game and certainly a release to be happy about. What's an otherwise short game (level-wise) such as R-Type without a level of challenging worthy of mastering? Same thing applies to R-Type III and it certainly does take a while to get through some levels, but once you get it... it feels sooooooo good to know how awesome you really are to be defeating such a tough title. I do feel bad that you Europeans didn't get DoReMi Fantasy though... I hope they release it over there soon. It's a terrifically fun little game. I find it a bit annoying that every week people are winging about the weeks release without realising some people might enjoy those titles . Well some of you are enjoying Super-R type which proves my point right but for me i recently found a copy of Perfect Dark to play on my N64 at the moment . Sommone please Brainwash Bill G. so he gives Rare to Nintendo, so we can get Games like 007 Goldeneye and Perfect Dark!